Goobers are a pretty simple candy: roasted peanuts covered in milk chocolate. The peanuts/chocolate combo is one of my personal favorites, and a fairly standard ingredient mix in the wonderful world of candy. 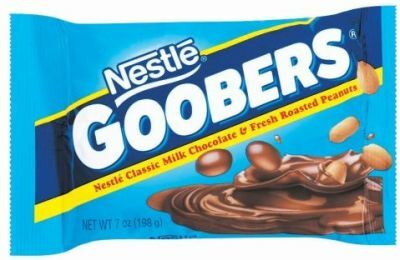 Goobers sets itself apart from the rest of the peanut/chocolate candies by removing all other ingredients: there is no nougat, no caramel, and no peanut butter. It is the peanut/chocolate combo in its very purest form: just the basics. A close cousin of the Goober is the Peanut M&M, which also consists of a peanut dipped in milk chocolate. Yet unlike Peanut M&M’s, which are relatively similar in size and shape, thanks to their standardized candy shell, Goobers come in a variety of sizes. This can work against Goobers at times: often enough, a Goober will emerge from the box that is, essentially, Goober-less. The Goober-less Goober (GLG) is a tiny ball of chocolate with no peanut inside that makes its way into the mix. I’ve almost never eaten Goobers without coming across several of these GLG’s. (GLG’s also find their way into Raisinets, where they are known, of course, as RLR’s.) I’m not sure if they are intentionally placed in the box or not but they are frustrating to happen upon. A chocolate-covered peanut without the peanut is a bit of a scam. Ultimately, however, Goobers are redeemed via the Handful Factor: eaten singularly, Goobers can be disappointing, but eaten by the handful, the GLG’s mix into the regular Goobers, leading to an extra chocolately chewing experience. The peanuts have a roasted flavor that balances nicely with the thick coat of Nestle milk chocolate, but I did notice that a few pieces tasted a bit bitter: perhaps the peanuts had been roasted for too long, or burned. I was also a bit disappointed, again, by the sizing; even the largest Goobers seemed a bit small. I used to LOVE Goobers as a kid, and remembered them being a bit larger, comparable to a Peanut M&M, but my memory could just be off. Still, Goobers provide a no-frills peanut/chocolate experience, and if that’s what you’re looking for, then Goobers might just be the candy for you, GLG’s and all. Goobers are indeed delicious. They’re my favorite movie theater treat because a lot of the other options at the theater can be a little too sweet. You can’t go wrong with Goobers! Goobers Rule! I agree they are the ultimate movie treat!